After capturing the hearts of the crowd, Jesus now calls another disciple, Levi (Matthew). Two things are significant about this calling. First, Jesus called someone no other religious leader would have chosen, a tax collector and Roman sympathizer — to any Jew of Jesus' era, Matthew would have seemed very much like a traitor to his heritage and to his faith. 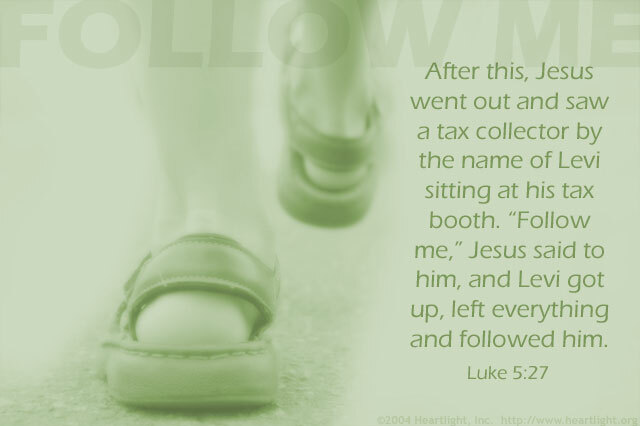 Second, the tax collector followed, leaving behind his livelihood and his fortune. This is a powerful reminder that there is no one we should write off as unreachable with the Gospel and as unusable by our Lord. Father of all nations, help me recognize the people you place in my path today who are ready to know more about Jesus. Give me the wisdom and the awareness to know when and how to speak with them about my Savior. In Jesus' name. Amen.